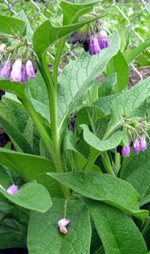 Comfrey Roots and Plants- alive to plant for farm, garden, animals. 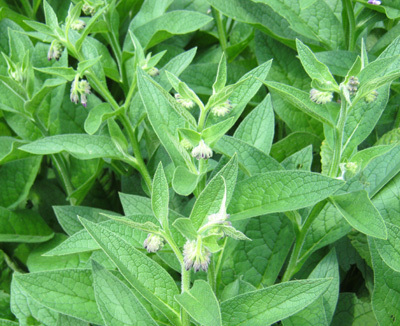 Comfrey leaves are high in nitrogen (protein), potassium, calcium, iron and phosphate with many trace minerals (micronutrients). They have 1.8-0.5-5.3 NPK (nitrogen-phosphorus-potassium). Kelp meal has an NPK of 1.0-0.5-2.5, and compost ranges from 0.5-0.5-0.5 to 4-4-4. So it's better than kelp and some compost. 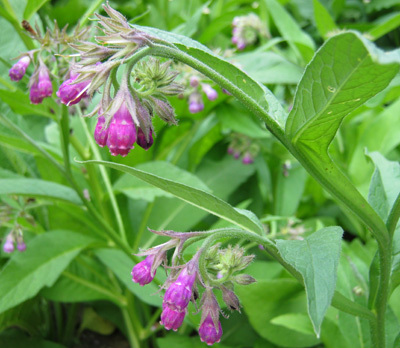 Comfrey has very long roots (6-8 feet) so are able to bring up nutrients from deep in the soil (dynamic accumulator). Its leaves have 2-3 times more potassium than farmyard manure. 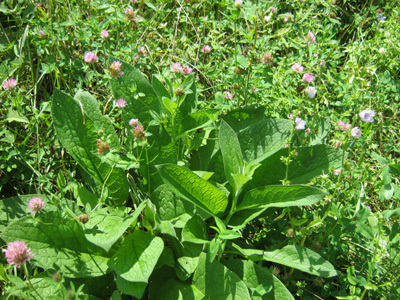 The photo with the comfrey on a hill of clover is from Chris, Pacific Northwest Outdoors. Chris is a permaculture enthusiast. 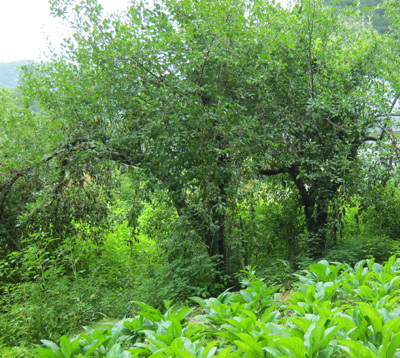 He uses comfrey leaves to make a liquid fertilizer for his fruit trees. 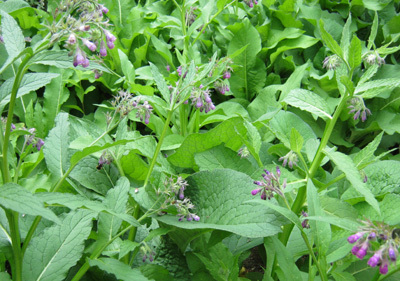 Add comfrey leaves to your compost pile to speed up the composting rate (compost activator) and to add extra nutrients. The leaves break down quickly. You can put 3-5 inches of comfrey leaves on top of brown compost material (carbon) such as dead leaves (from other plants) or wood shavings. Add a layer of food scraps from the kitchen and other green (fresh) material (nitrogen). Put some dirt on all of this to help the composting process. The comfrey helps heat up the pile. 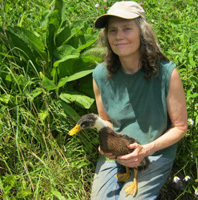 Make a fertilizer tea (compost tea) with comfrey leaves. Fill a barrel or bucket half with leaves. Then fill with water. Let them rot for 4�5 weeks depending on temperature. You create comfrey tea. It can be used full strength or diluted 50:50 with water. Use it to water your plants. Can be used in hydroponics. Some research shows that comfrey tea sprays activate natural defense mechanisms in seedlings, making them more resistant to disease. Make holes in the bottom of a bucket. 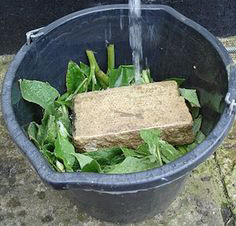 Put fresh comfrey leaves in the bucket with rocks or bricks on top of the leaves. Put on top of another, empty bucket. 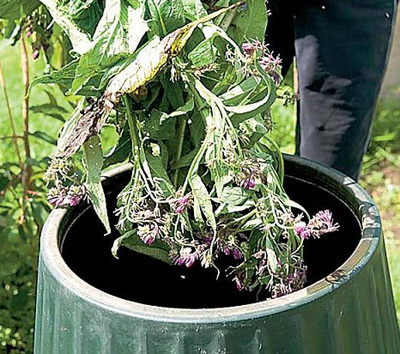 The leaves decompose and create a thick black comfrey concentrate that oozes out of the hole. Dilute with water at 15:1 before using. The leaves are low in fiber (low carbon) so over time they decompose into this thick black liquid. 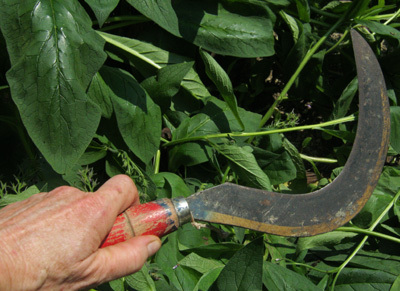 Use comfrey as a mulch or side dressing (green manure) by putting 2-3 inches of leaves around plants. The leaves slowly break down releasing the nutrients. But it is better to limit mulching of root crops and leafy greens because they may go to seed sooner (too much nitrogen in comfrey). According to Wikipedia Dynamic Accumulators are "plants that gather certain micronutrients, macronutrients, or minerals and store them in their leaves. These plants become rich in a certain substance and can then be cut down. This can be used as a fertilizer or as part of a fertilizer mix for other plants that may be deficient in those particular nutrients. 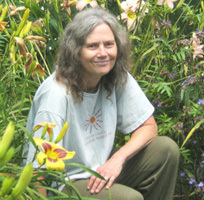 These types of plants play an important role in many Permaculture Guilds." This mulch is especially good for fruit trees. Or better yet grow comfrey plants around fruit trees. Plant 2-6 or more plants around each tree depending on the size of the tree. If planting Russian Comfrey, plant at least 3 feet away from the trunk. True Comfrey can be planted a little closer. Larger trees can have plants placed 3 or more feet apart under the canopy of the tree. You don't have to harvest the leaves, just let them grow/die/decompose back into the soil. Or you can harvest the leaves and throw them around the tree. 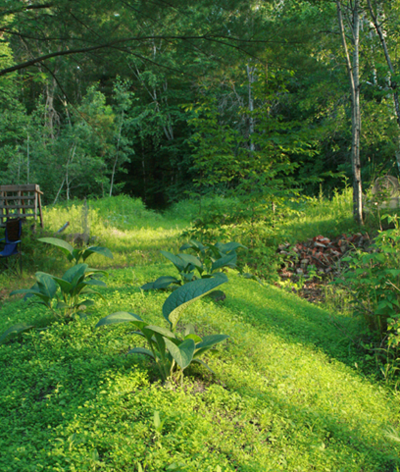 Comfrey, Permaculture and Fruit Trees. Improve plant growth by adding comfrey leaves to the bottom of planting holes for potatoes, tomatoes, cucumbers, peppers, fruit trees/bushes and other potassium-loving plants. Do not put flowering stalks in holes because they might root. 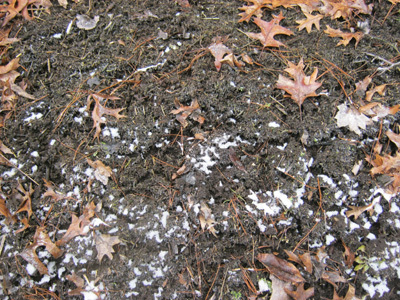 It will not rob the soil of nitrogen because the Carbon:Nitrogen (C:N) ratio is lower than that of well-rotted compost. This is unlike straw and dry leaves that take nitrogen out of the soil while they decompose. Comfrey leaves make a great fertilizer to put in a potato planting hole in the spring. Dig the hole, place some comfrey leaves, put the potato on top of the leaves, and cover with dirt. 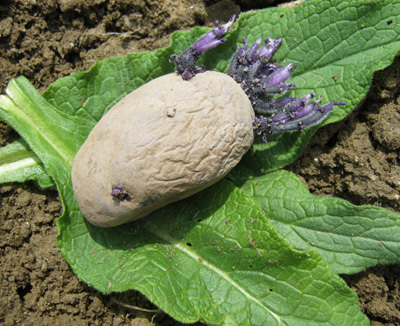 The first photo is a Purple Majesty potato on comfrey leaves. 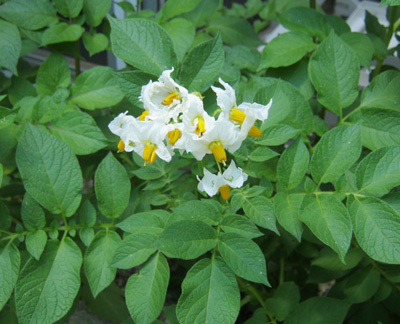 Then a happy potato plant with flowers. 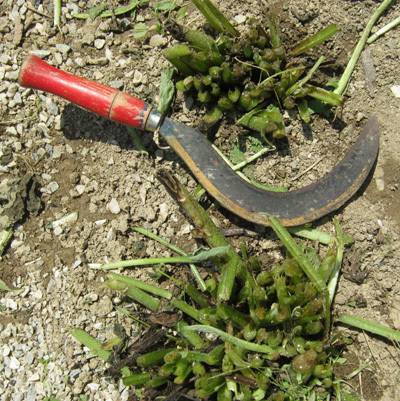 From "Farm Radio International": A man in South Africa has learned from a village elder that comfrey leaves are good fertilizer for his potatoes. One day Tabo was out in his garden working. He was planting potatoes. He was planting them different ways to see which would grow the best. 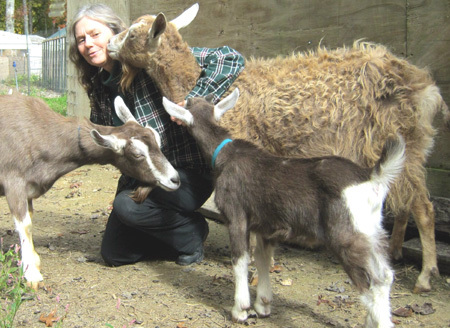 Next to his animals, Tabo loved nothing more than working in his garden. Some of the seed potatoes Tabo planted with no preparation; others he planted by mixing animal manure into the soil first; others he planted by mixing fertilizer he had bought from the wholesaler in town. And a few potatoes he planted by putting a number of large leaves from a comfrey plant (Symphytum spp.) under them first. He simply placed some comfrey leaves in the bottom of the planting hole, placed the seed potatoes on top of the leaves, and filled the hole with soil. An old herbalist had told him about this last trick. Where the old herbalist had learned it, he wouldn�t tell. Comfrey (compfrey, comphrey, compry) leaves are fast growing. You get about 4-5 pounds of leaves from each cutting of a mature plant (2 years old or older depending on growing conditions). You should get about 4-5 cuttings a year, usually every 5 weeks except in winter. Do not cut the plants much the first year but do remove the flowers the first year. 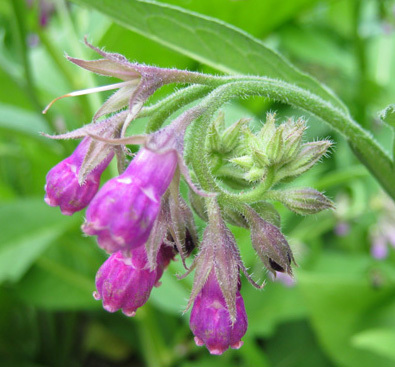 It is best to remove all flowers or flower stalks on the comfrey because they take a lot of the plant's energy to create the seeds. 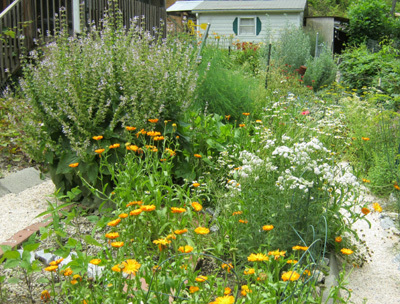 However, we always leave a few plants with flowers because the bees and other beneficial insects love them. And the flowers are beautiful. Cut when leaves are about 2 feet high. Harvest using clippers, sickle or scythe. Cut the leaves 2 inches from the ground. It is easier if you cut all leaves from the plant at one time. However, you can just take a few leaves at a time if you want to. It is best to wear gloves. It is better to harvest the leaves before they flower since flowering uses up a lot of the plants energy. Reap on a regular basis. Stop cutting early fall so the plants have time to regain their energy for winter dormancy. Comfrey foliage (leaves) withstand frost down to 15 degrees for short periods. 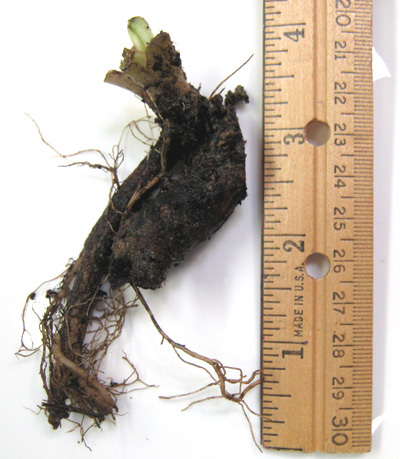 Below that the leaves die, and the plant (roots) go into dormancy. 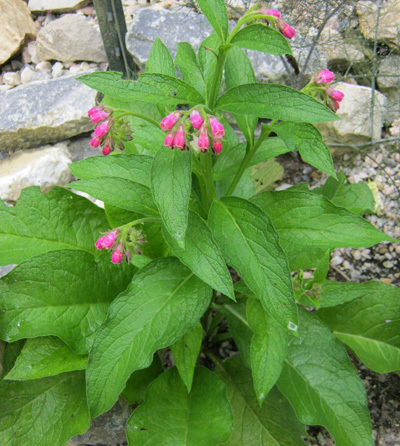 Comfrey is a perennial. If you do not want the plant to spread, then do not rototill or plow the plants. This will cut up the roots into many pieces. 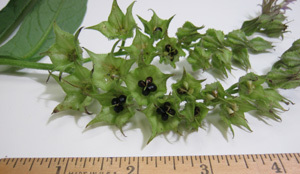 Many of the pieces will then grow into a new plant. Of course, if you want more plants this can be an advantage.